Eklecty-City.fr had the great honor to interview Stefanie Joosten, her first interview given to a French site. Dutch model and actress Stefanie resides in Japan for four years. Recently we had the pleasure of discovering her in Metal Gear Solid V : The Phantom Pain, the last game of Hideo Kojima in which she played Quiet, one buddy game of the Big Boss. Our meeting with Stefanie Joosten. Hello Stefanie, first of all thank you for granting us this interview. It is an honor for us. For our readers can you introduce yourself ? Stefanie : Thank you, I’honored to be interviewed by you! 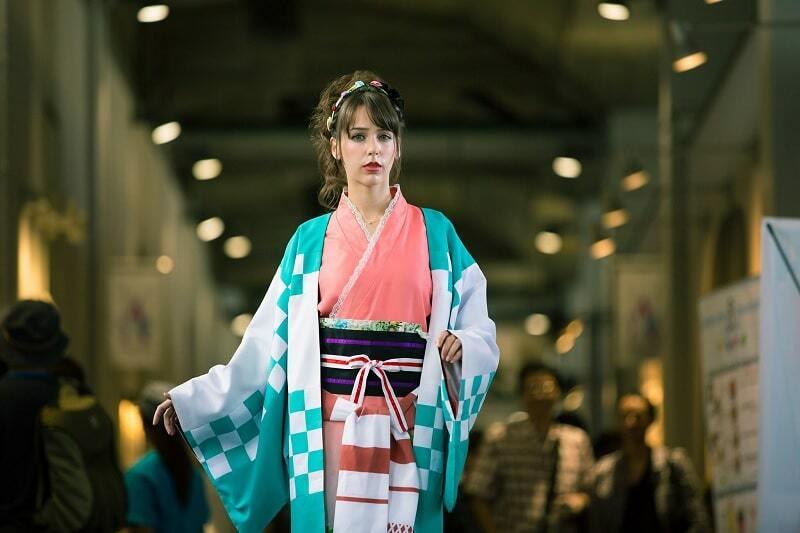 I’m Stefanie Joosten and I work as an actress and model based in Japan. I am originally from the Netherlands, but moved to Japan about 4 years ago. You have always been intrigued by Japan and otaku culture. What was the trigger? Stefanie : Actually I have always been a bit of a nerdsince I was a kid. I played a lot of videogames and I loved the Pokemon and Dragon Ball anime. After I finished high school, I decided to learn Japanese in University. Once I stayed in Japan for a year on an exchange program, my mind was set on living there, so I decided to start my career in Japan. You have played video games since you were a child, can you tell us about the game that touched you the most? Stefanie : When I was little, I played a lot of Super Mario games and Pokemon. But it was only when I got a little older that I discovered the Final Fantasy series. I played Final Fantasy X, and I loved the story and atmosphere. It was one of the first games I played that had a deep story to it, so it really touched me. You decided to attend Japanese lessons at the University of Leiden in the Netherlands. How long did it take you to master the language? Stefanie : It took me a lot of years actually. Japanese is not an easy language. I improved a lot quicker once I moved to Japan though. Then you had the chance to go on a language exchange in Japan where you obtained a Master degree. It’s impressive ! What was your dream career at the time? Stefanie : I had already earned a degree at the university I was studying at in the Netherlands actually. It was after that that I wenton an exchange program to Japan, and got into modeling work. I did not really know yet what career I wanted to pursue back then, but modeling and acting turned out to be a lot of fun ! Especially being involved in a video game was something I could only have dreamed about, so I’m really happy things turned out the way they did. Recently we learned you have released a photo book. Can you tell us more about the project and how this took place? Stefanie : I started working on the photo book mainly because I wanted to do something on a cultural level. I enjoy modeling as a away of expressing myself, but in this photo book there is an added aspect of showing a side of Japan that not many people know about. The team I worked with was great, and even introduced locations in Tokyo to me that I had never heard of. Stefanie : Currently an official release had been confirmed only in Japan, but we are working on getting it available to people overseas as well. In parallel, you’re also an actress. You played in both miniseries « Gekitsui » and « Do S Deka ». Can you tell us more because they are unknown in France? Stefanie : These are Japanese tv drama’s that I occasionally act in. Since they are aired in Japan, the main actors are Japanese of course, but sometimes foreign side characters make an appearance. That’s the kind of roles they were. Do you have any new feature movies or series projects? Stefanie : Yes, I was definitely very scared ! I don’t usually play horror games or watch horror movies… it’s not a strong point for me. But since P.T. was made by Kojima-san and was such an amazing game, I just had to try it. I still think it’s a shame I never properly learned it… it’s such a beautiful language. We can see you in the last « Metal Gear », Metal Gear Solid V: The Phantom Pain, how did you come to the project? Stefanie : About 3.5 years ago, I received a call from my agency about an audition for an upcoming Konami game. They didn’t have any more information about the project, since it was still a secret. I went to the audition, and got to audition for the role of a female assassin, which turned out to be Quiet ! How was your meeting with Hideo Kojima? Stefanie : He was present at the first audition, so I already started to suspect that the audition might be for a new Metal Gear Game, haha. When we started working on the motion capture, I could immediately tell he has a great passion for his work. He has a great sense for detail as a director, and really looked like he was enjoying every part of making the game as well. If you had a message for him, what would it be? Stefanie : I’m so grateful to have gotten the chance to work with him. I think he’s one of the best creative masterminds in the gaming industry, and working with him was one of the most fun experiences I’ve ever had. I hope he will continue to revolutionize the gaming world in the future ! You have interpreted the theme of your character (Quiet) in Metal Gear Solid V: The Phantom Pain. Was singing a new challenge for you? Stefanie : Singing has always been a hobby of me and I have had a few small opportunities to sing for my work as well, but singing an original full song was a new challenge for me ! I’m not really a professional singer, but I was asked to sing Quiet’s theme as an actress in character. So it was really an emotional experience to sing the song. How did you feel when you found out Quiet modeled from your face? Stefanie : It is a very strange feeling. It’s really amazing how much technology has developed. I could never have thought that it was possible to become a video game character yourself. It is a huge honor, and also very surreal. Is working with the process of motion capture something difficult and challenging? Stefanie : There were a lot of things I had to learn for the role of Quiet in technical terms. She had to look and move like a professional assassin, so I needed to learn how to hold and use weapons correctly. This was something competely new to me, so I had to do military training before starting on the motion capture. When you learned that your character would not speak, how did you figure yourself bringing emotions through interpretation? Stefanie : I most of all tried to feel how Quiet would be feeling. During the motion capture sessions, I actually think I got a grasp of that sooner then I though. 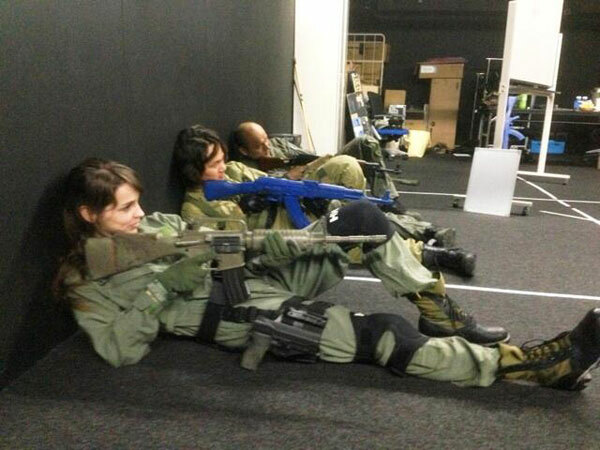 While we were rehearsing and acting out the cut scenes with the other actors, Quiet would be the only one not being able to speak. This made me feel very isolated, but I felt that Quiet had to have a strong personality to be able to live with that. While you were working on the game did you meet Kiefer Sutherland and record with him directly? Stefanie : Unfortunately I didn’t do any recording sessions to get her with Kiefer Sutherland. Facial capture and voice recordings were mostly done separately for all actors, because of the technical restrictions the capture process brings. To interpret the character of Quiet, you followed a combat training. Can you tell us more? Stefanie : Yes, I had to attend military training sessions before we started on the motion capture. These sessions were provided by Kojima Productions. Their military advisor, Mori-san, led most of the sessions. Most of the training was done in group sessions, but I also had a few personalized training sessions that were more focussed on the specific skills needed for the role of Quiet. Metal Gear Solid V : The Phantom Pain is the first video game in which you played. Would you like to repeat the experience? Stefanie : I would love to work on more games ! Since I am a gamer myself, it is awesome to see all the hard work that goes on behind the scenes. Being able to be a part of it was one of the best experiences I have ever had. On Eklecty-City.fr, we also focus on cinema. What are your favorite movies, directors and actors ? Stefanie : I really like sci-fi movies, for example Blade Runner and The Matrix are some of my favorites. Actors that I really admire are Scarlett Johansson and Keanu Reeves. Would you be interested in a career in the United States ? Stefanie : Yes, actually I would. I really enjoy working and living in Japan, but I would love to explore the world a little bit more when it comes to my career. The character who annoyed you the most? Stefanie : A little old school, but I still love Rex. Stefanie : Otacon I think. He seems to have the most human personality of all characters in the game. Who do you prefer between Solid Snake and Big Boss? Stefanie : I can’t really say. I like them both. They both have their strong points and unique ways of living. According to you, what character in the saga deserves to have their own game? 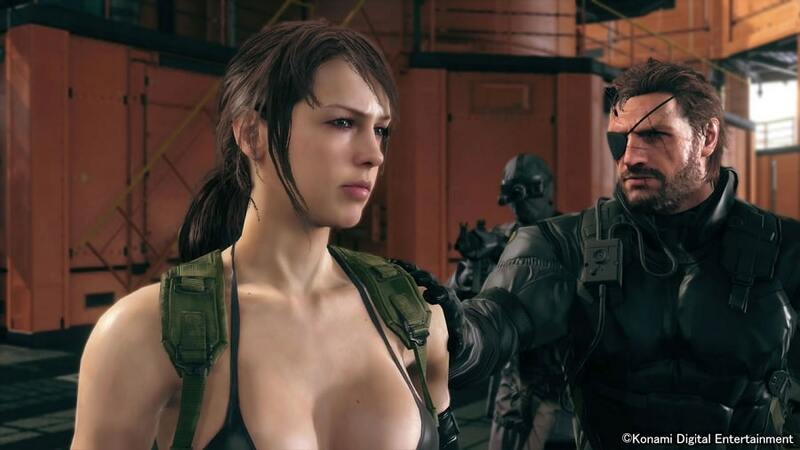 Stefanie : A spin-off about the backstory of The Boss from MGS3 might be really cool ! Do you have a message for our readers and your fans? Stefanie : First of all, thank you for all the good words I have received about MGSV ! I am really happy to hear that people are enjoying the game and are using Quiet as a buddy ! To people who have not played the game yet, I hope you get the chance to play it. It is definitely worth the experience ! To conclude, what kind of question would you want to be asked and what would your answer be ? We have reached the end of the interview, Stefanie thank you again for everything. Stefanie : Thank you so much for asking me ! I hope you have a great day ! Interview by Thomas O. and Julien D. for Eklecty-City.fr, who thank Stefanie Joosten for having lent the game an interview. Also thank you to everyone who made the interview possible.